She is practical and down to earth, seeing to the day to day details of maintaining the security of hearth and home. She represents motherhood, and the growth of family. The Queen of Pentacles represents love expressed through domestic behavior and venues. She is thorough and responsible, setting her own stability in line with that of the families. 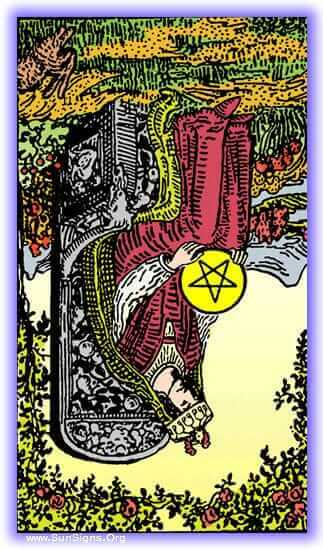 The presence of the Queen of Pentacles represents good financial times and the security of home. It also shows the need to utilize your maternal nature, compassionate, nurturing, and realistic attitudes when dealing with present circumstances. The appearance of the Queen in your past indicates that you’ve been successfully maintaining the stability of your home life, and serving as a maternal support to those around you. You’ve managed to keep your home strong and secure, and have taken care of those who’ve been needing it. The Queen of Pentacles tarot card in the present position indicates the need to keep your financial and home life stable. Those around you are in need of your support, and the best support you can give is a safe haven in your home. There will be a time in the future which will call on you to be generous with your wealth and love. It is likely it will be someone not in your home, who is in need of a caring and maternal figure to help them through a time of difficulty. The Queen of Pentacles reversed represents an over-dedication to keeping our home and family life stable. In all the effort put in to stabilizing our home, we’ve lost track of the people that actually make up our home. The house is clean, your flowers immaculate, and the neighbors all think well of you, but internally the house is falling apart. It can also represent an over-abundance of mothering, turning to smothering. 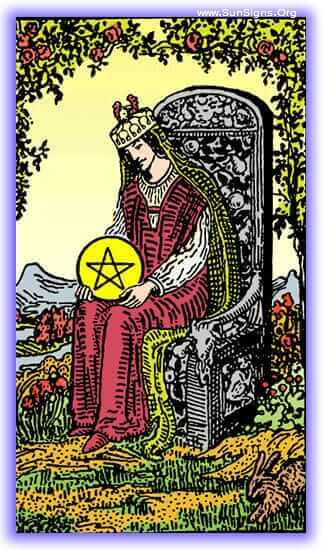 The Queen of Pentacles indicates that you’ve been pouring your energy into taking care of the home. But you need to start taking care of the people who make it up. Sometimes an over-attentiveness to the ‘happy homemaker’ and ‘happy families’ situation will leave you letting the apple rot while you polish the skin. This is time for you to stop worrying about the physical details, and to start worrying about the familial. You’ve been displaying a tendency to over mother those people around you. Your shepherding has turned to min-management, and you’ll need to back off and give those around you some breathing room, and make them responsible for themselves. The Queen in your future represents that you’re coming up on a time when some self-care is going to be necessary. You’ve been spending so much time taking care of others that you’re on the way to letting your care of self fall by the wayside. When this time comes, take the advice of those around you and indulge in some self care. Next Your Spouse Is Cheating! Is It The End Or A New Beginning?